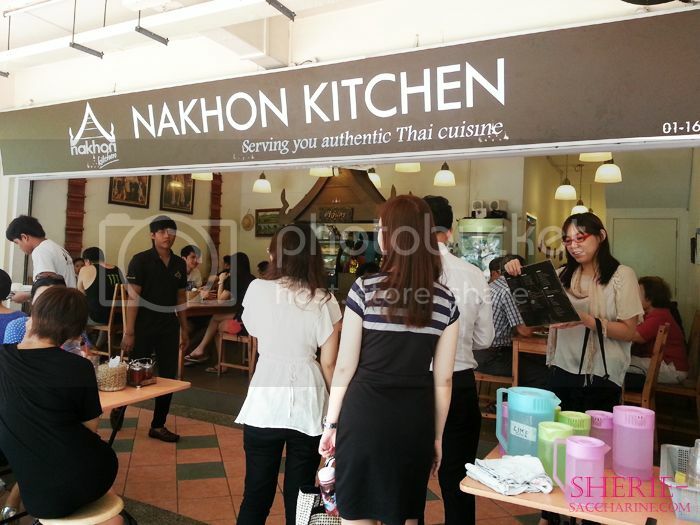 Last Monday, my colleagues and I decided to pop by Nakhon Kitchen at Bedok North for lunch! 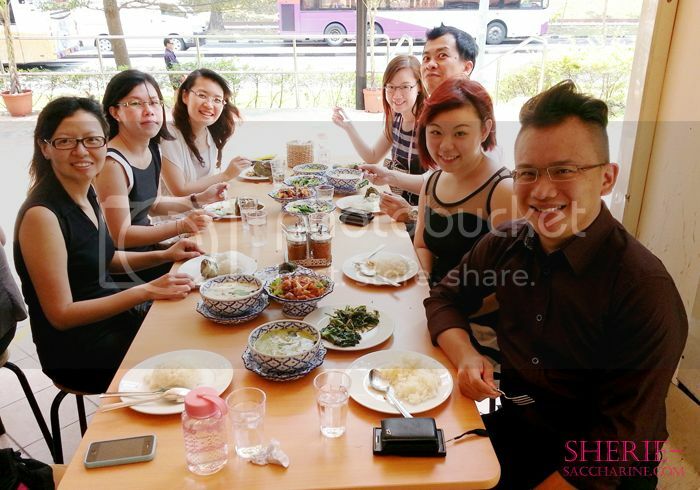 The 8 of us drove to Bedok and we were lucky! No Queue! Michelle happily looking at the menu! There's 8 of us, so naturally, we ordered dishes to share! 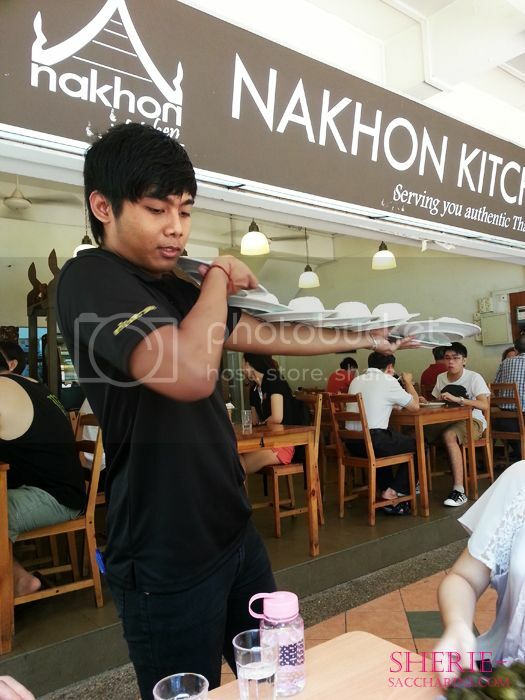 Look at the masculine waiter doing his 7 rice stunt! If you can't do it, then give this man some credit! Thoughtful paper towels provided and 4 chilli to choose from! Happy peeps ready to tuck in! 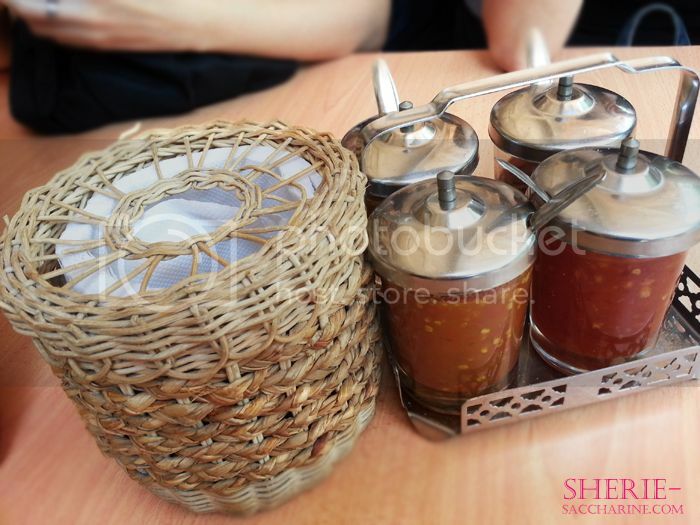 Cheryl decided to be the odd one out and ordered her favourite Phat Thai! 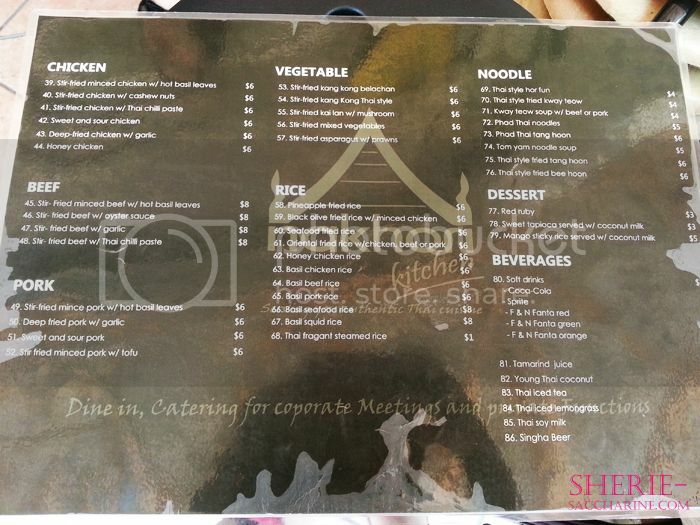 My favourite at Thai restaurant too! 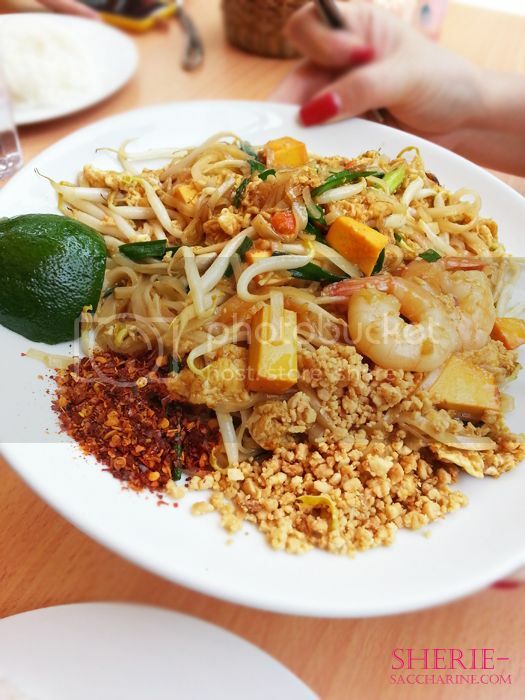 I love Phat Thai with generous amount of peanuts and chilli flakes! The lime is big and you can see that the prawns are soooo succulent! I hate Green Curry!!! Cos the last attempt at Thai Express years ago really caught my tongue on fire and made me full from the iced water! BUT... 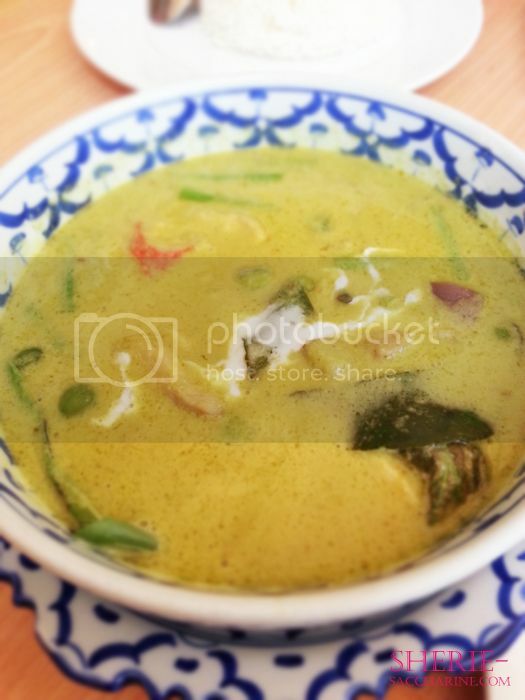 This Green Curry is an exception! For a non-spicy eater like me, the curry is mild enough to make me eat in peace and tasteful enough to make me "drink" the curry and eat them with rice. The chicken in the curry are tender and fully infused with the curry and coconut milk. You may choose either Beef or Prawns in replace of Chicken too. This is the kind of dish that won't go wrong. Crispy fried tender chicken with mild sweet & sour sauce, just like our Chinese sweet & sour pork! Furthermore, the cashew nuts are crunchy! Same verdict as the Green Curry. 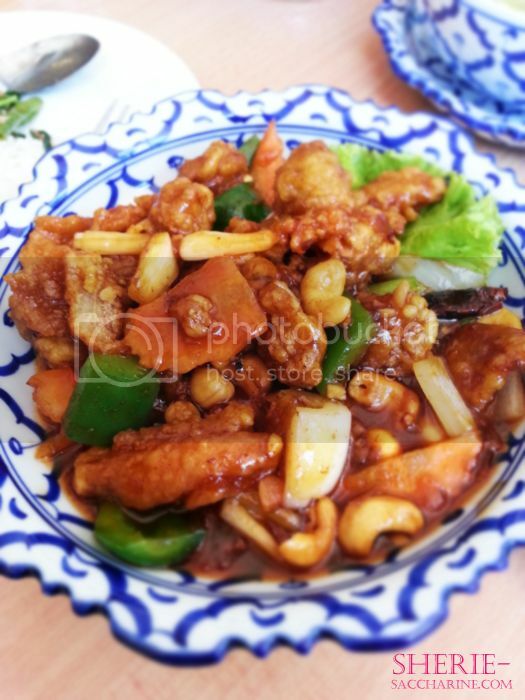 I love how Nakhon Kitchen has just the perfect level of spiciness that suits my taste bud! 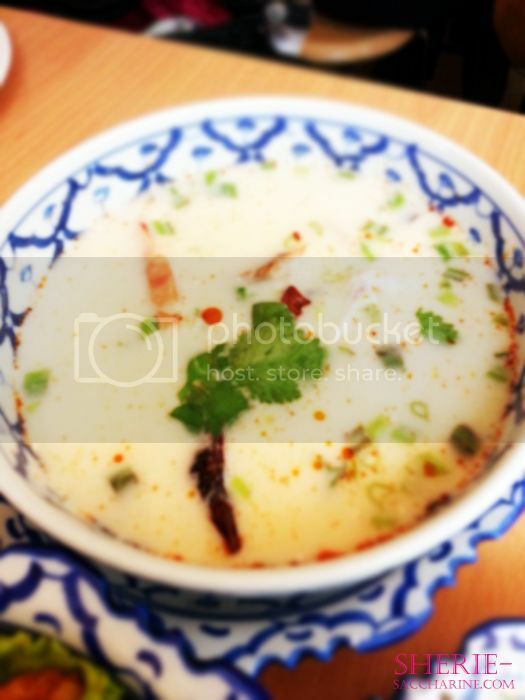 This is not too sour like other Tom Yam, so guys are welcome to try this dish too! BUT.. I guess I was too unlucky, the squid taste like a piece of tasteless rubber with no Q-ness at all! Bad bad bad.. Nothing special about this Kang Kong. I prefer my Zi Char style Sambal Kang Kong. 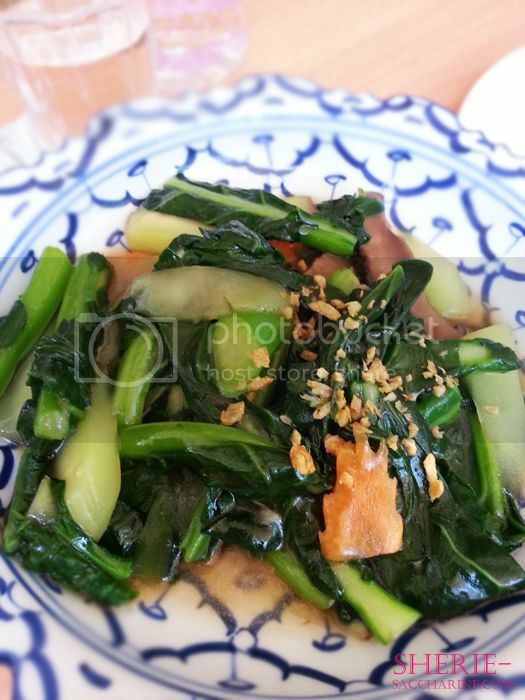 There is not much flavour from the Belachan, and the veggies are too oily. 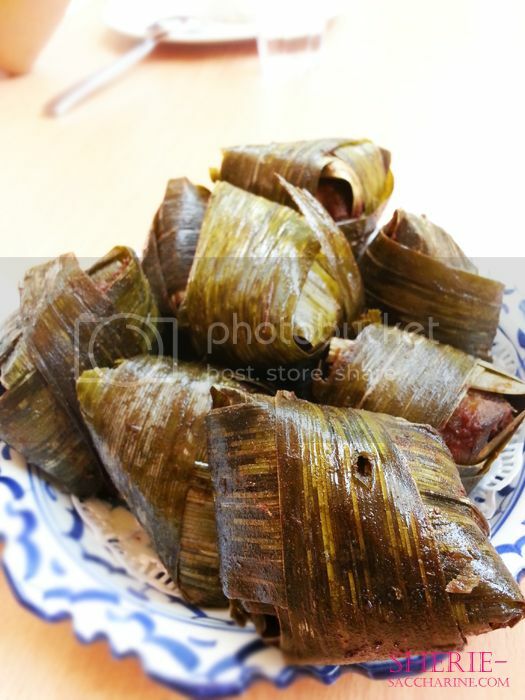 The kai lan is cooked in Chinese style, nothing special. 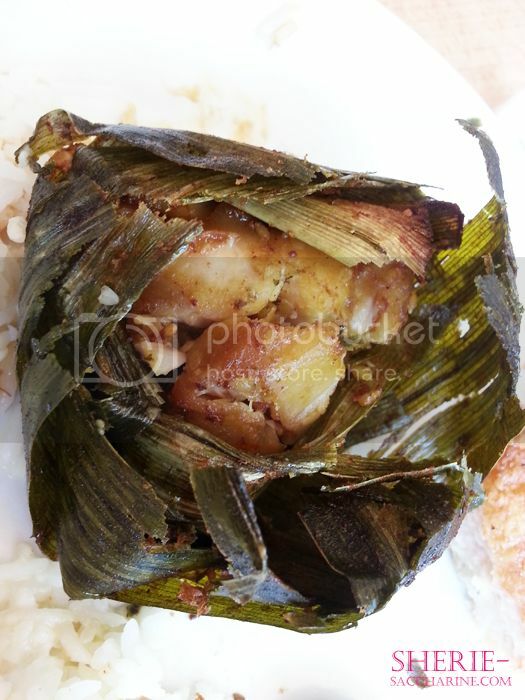 The Pandan Chicken is a tad too dry due to the long cooking time. I find that there is a lack of juiciness and tenderness in the meat. Last but not least, the most expensive but also my favourite dish! 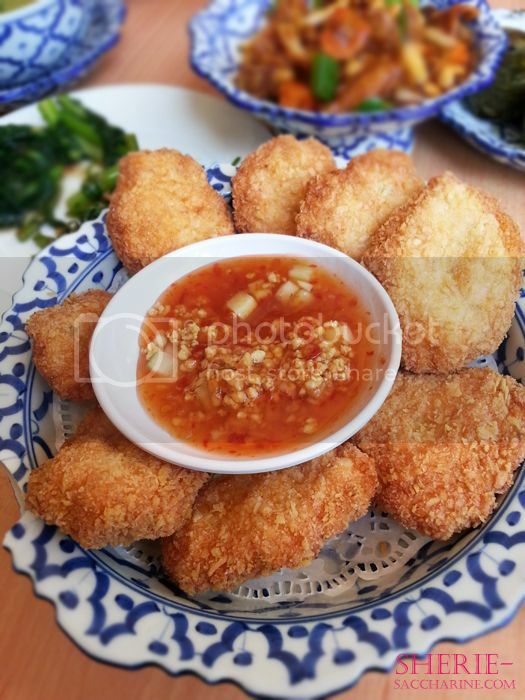 Fresh tasteful juicy prawn paste coated with thin crisp that is fried perfectly! I am also a big fan of Thai chilli sauce! 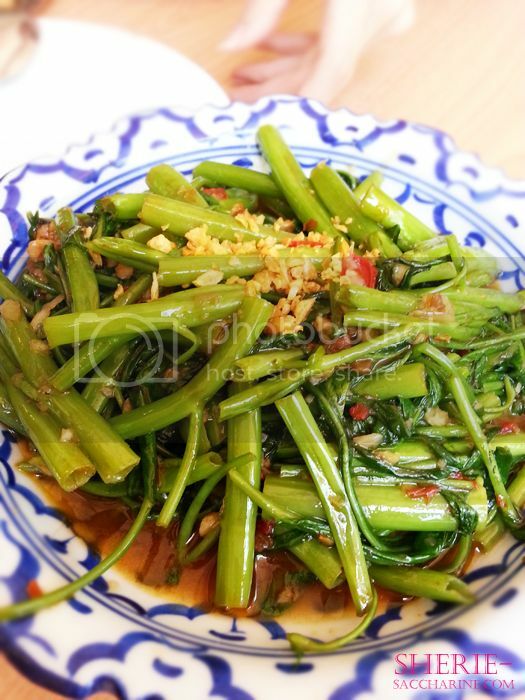 The best combo you can have at Nakhon Kitchen, don't forget to order it when you are there. Another must-have for the milk tea lovers! 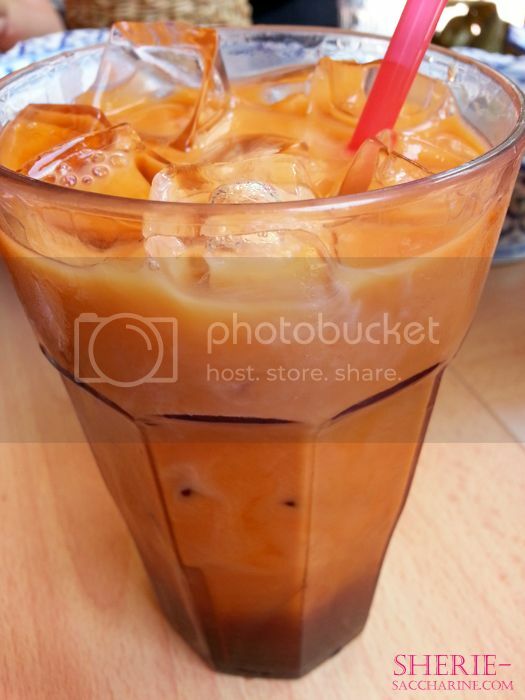 This might too expensive for a cup of tea but where else can you find authentic Thai iced tea in an affordable restaurant? 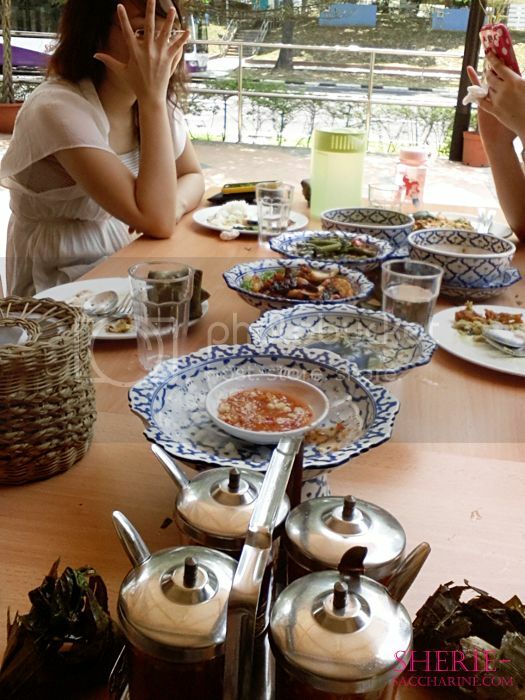 But for small eaters, it is advisable to share your tea as it might be too filling for you after a hearty meal! 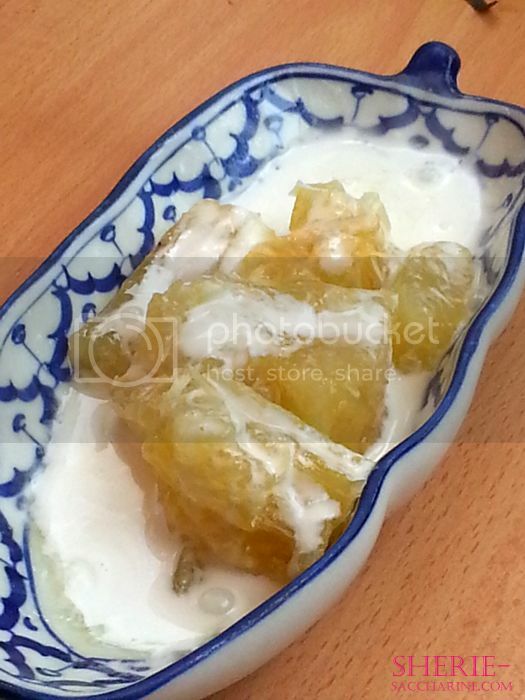 I was sceptical about this dish 'cos I though it will be too sweet! But the tapioca is "chewy" and not too sweet. Guys will definitely love it too. 8 stomachs filled to the brim! 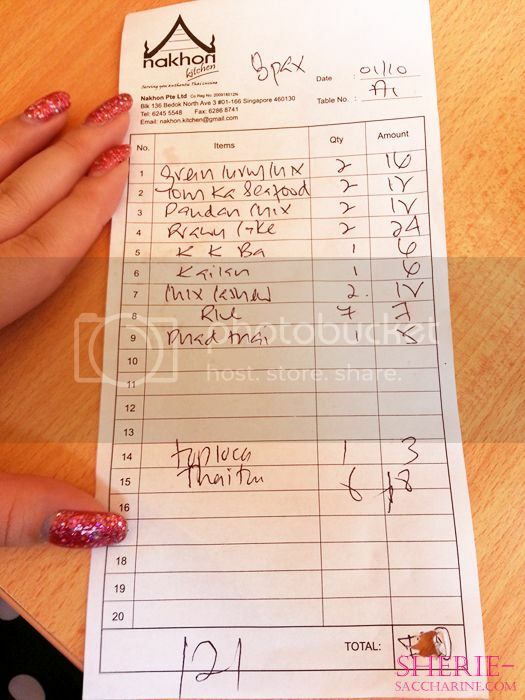 Each of us ended up $15.10 poorer and I was severely blamed 'cos the Prawn Cakes I ordered were the most expensive dish ($3 per piece)! Nonetheless, we enjoyed our trip there!